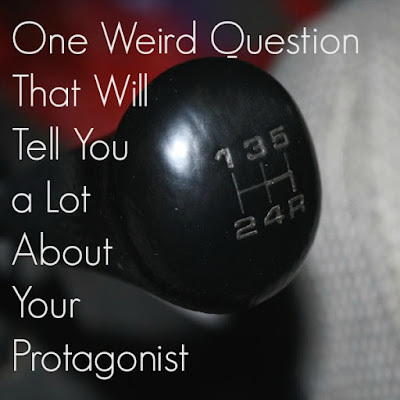 What happens when your main character is faced with a stick shift? See, my neighbor had a situation (which was a whole other stressful thing I won't get into) in which she needed to move her husband's car. She got panicky because she didn't know how to drive a stick. I said, "I do. I'll move it for you." She handed me the keys, and I got behind the wheel of his turbo-charged, souped-up car. It was his baby. (He was in Indonesia.) I turned it on and it made that rumbly purr, which sent a little shiver of dread down my spine because it was in that moment I realized I haven't actually driven a stick shift in quite a long time, and the last time was my brother's elderly truck which required some finessing. This car was anything but elderly. Anyway, I very carefully eased it into first gear and out of the garage, and over to the neighbor's driveway where we'd been told we could park it for the time being. Everything went fine, and I felt a little twinge of pride and gratitude at having that skill, but on my way home later, I found myself thinking, "What would my MC do if she was faced with a situation involving a stick shift?" And, more importantly, "Why?" 1. She would shy away. She's never driven a stick before, because they make her nervous. Nice, safe, easy-to-use automatic, please. 2. She would shy away. Her parents bought her her first shiny new car when she was 16 and it was an automatic. She's never felt the need to learn. 3. She would shrug and give it a go. She's got no other options and she's never driven one before, but how hard can it be? 4. She would hop right in and get going. She had a tough life growing up; all she's ever driven were clunkers with stick shifts. 5. She would reluctantly agree. She learned how to drive a stick once, but that was a long time ago, and she hasn't done it since. What if she messed up the car? 6. No problem. Everybody knows driving is way more fun with a stick shift! 7. She would smile and get behind the wheel. Her parents raised her on automatics, but those summers spent with Grandma? Well, they weren't exactly knitting the whole time. - Was whether or not learning to drive a stick a decision she made or a decision someone made for her? - If she did learn, who taught her? What was the learning experience like? - Is it a skill she has ever needed? Why or why not? - Does this character's reaction to being faced with a stick shift surprise the people around her or not? As you can see, this question takes you into your character's past, touching on past relationships and even socioeconomic status, and it also reveals quite a bit about her personality, both past and present. If you're writing a fantasy or historical novel, then you might think this question can't apply, but what if your characters were transported into modern day, and they had grown up in a world with cars? How would their personality/status/relationships translate in a modern world? I hope you take this weird question and get to know your characters better this week.